CULTURE OF REVOLUTION · Intentional Destruction Become leaderless ROD BECKSTROM, an entrepreneur and Silicon Vallery cfo, was on a jetliner waiting to leave New York's LaGuardia Airport. Then, two planes smashed into the Twin Towers, where Rod oſten held his meetings. Rod then dedicated his purpose to understanding the dynamics behind such devastation. 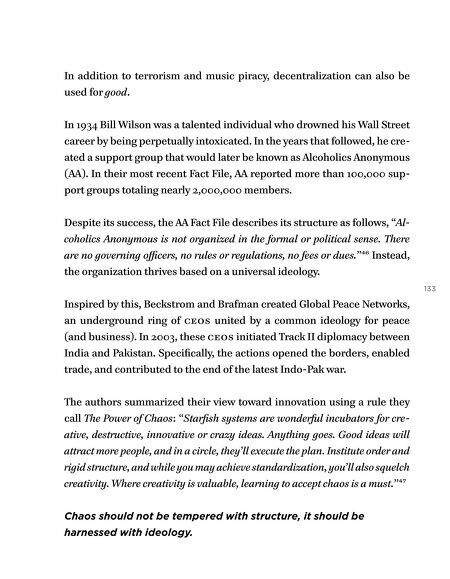 He studied terrorist networks and started to identify patterns between the structure of Al Qaeda, P2P file sharing, and Alcohol- ics Anonymous. 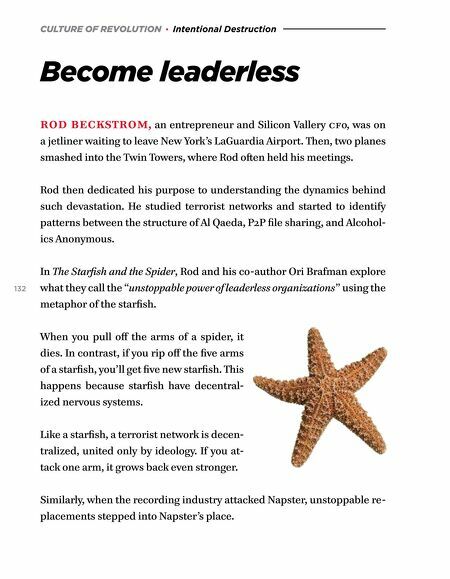 132 In The Starfish and the Spider, Rod and his co-author Ori Brafman explore what they call the "unstoppable power of leaderless organizations" using the metaphor of the starfish. When you pull off the arms of a spider, it dies. In contrast, if you rip off the five arms of a starfish, you'll get five new starfish. This happens because starfish have decentral- ized nervous systems. Like a starfish, a terrorist network is decen- tralized, united only by ideology. If you at- tack one arm, it grows back even stronger. Similarly, when the recording industry attacked Napster, unstoppable re- placements stepped into Napster's place.